A few of you know why I have not been blogging as much. In the soap opera that is my life, this is but another blip. Some of you also know we had visited India and have only recently returned. This year's visit did not involve rest and relaxation. As an aside, it usually doesn't; but this year was particularly difficult. In any case, we went to Bombay and then to Kerala; three days later, my mother-in-law was hospitalised and we spent our time going to and from the hospital from our respective houses. We discovered that if we got out of the hospital (or our homes) at a certain time, say, anytime between mid-morning and midnight, then it made no sense to take an auto rickshaw so we could get home or to the hospital quickly. As far as eye could see, vehicles would be packed together bumper to bumper. The first time it happened, Sadu was glad he was walking. The next day, on my way back, I didn't even bother looking for a rickshaw. It was faster to walk. As always, when I need to keep the blog going, I turn to my personal caped crusader (well, not really, but I'm allowed some poetic license) to fill the lacunae. So, here, is another of Sadu's laments. That's when the monsoon ends in Keral-uh. And so, of course, the rains began in earnest. What did I see in front of me? With cars, buses, rickshaws and the occasional lorry. "Saar, what ails these vehiculared people?" He winced and spoke with rare eloquence. "Cars! Too many rich people, that is all, simbly." His sympathies, definitely lay with the proletariat. "But 'til where," I asked? "No, not even from Kottayam to Trichur." Yet we are still stuck in the car." Lulled by melodious party propagander." And ask questions in the assembly." Will not make it beyond Sultan Bathery1. "Even if they do, they will be stuck. Showered the ruling party with vituperation. Shaju-mon, Gracy-mol, Kerala State Road Transport Corporation. No vehicle to go forward, no person to walk. The hartaal, raked in the moolah. In a happy drunken stupor. And into their garages cursing. To vote them into a ruling capacity. Of the God of the Traafic jaam. Yet, they do believe in destiny. * Old CPI slogan. Quite literally, the Russians are our people, Stalin is our leader. 1. Sultan Bathery is in North Kerala, far from Thiruvananthapuram, the capital. It is actually a mispronunciation of the word 'battery'. Tipu Sultan used an unused Jain temple to place his gun battery here. 2. Thodupuhza is in central Kerala, and a bastion of the Congress party, should the opposition have had the temerity to reach it. With humble apologies to John J Keats, Theodore S Geissel, and Kerala politics. Hehehe. Anu, Sadu is a gem. This is so much fun. It actually inspires me to finally plan a trip to Kerala - and then makes me wonder, "Really? Do you want to get stuck in all that traffic, and step into a poodle?!" Mumbai is the most horrible city.Man the city stinks.The pollution,the population,the rains...yucks !! Mumbai stinks.I will never go to that city. :) Thanks for sharing Sadu's poetry. Will make traffic jaams easier to bear, I think. Sadu comes up with another hit! The part about the liquor stores raking in the stuff on the day before the hartal - only a person who has lived in Kerala can appreciate that! 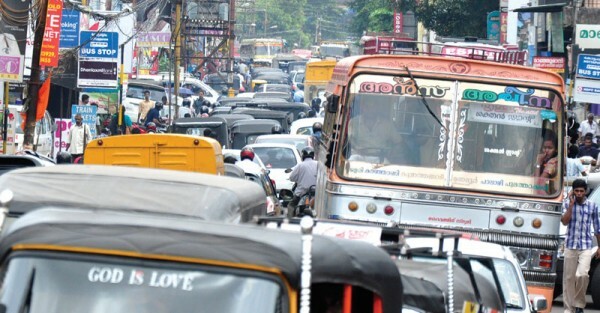 This bad traffic is precisely what I am dreading, come October, but I don't know if Madras is as bad, or worse. I have heard that Bangalore is also bad and we are going there also this time. The trip promises to be interesting but I am afraid, grid-locked! I am sure you are relieved to be back home. Trichur is walkable in any direction, Madhu, so don't let our loving digs at our hometown dissuade you from making a trip there. Actually, plan a trip, do! Sometime in June-July-August next year, when I'm there? You can stay with me, and use my house as the base camp. 'Step into a poodle' was sheer genius! I cackled so much when I read that. I will tell him so, Batul. I know I will never look at traffic 'jaams' the same way again! 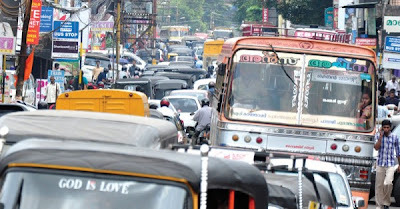 Bangalore traffic is horrible, Lalitha, and I can personally vouch for that. (So speaketh an ex-Banglorean.) Are you going to be visiting Kerala too in October? Won't June-August be sultry and rainy in Kerala? But, then - Delhi is hot and humid too, so I don't think that makes a huge difference. And I bet Kerala is waaaay more beautiful. :-) Chalo, I will think this over! When I started driving the car, I used to time regular distance to my work place by listening to an audio cassette. I would normally reach my work place in a song less than the songs on two sides of a 60-minutes cassette and while returning that one song plus another cassette would do the job. However, there were days when I would listen, anything from a quarter, to some time a full cassette over again, becuase of the jaam [abbreviated version of a long traffic jaam]. Of course, after a few 'regular' repitions of this expereince, I used to carry a cassette extra over a to and fro regular quota. Now, possibly one DVD can do that job!!!! Once upon a time, I could have told you exactly when the rains would come - and go. Now, they come when they please (or not, as the case may be); I had never seen sheets and sheets of rain during Onam time (Aug/Sep) but this year, that's when the raingods decided to bless us with their munificence. June was dry. Kerala *is* beautiful, and as I said, there are some lovely places to visit. Think about it! :) That is the best description of the daily commute I have ever heard! Thanks for the comments folks. The pome (Ern Goon) could do with a bit of brushing up but had to get it out there for public consumption y'know. Sultan bathery! Wonder if it is the one near Mangalore? Harvey, the Sultan Bathery in the 'pome' is a small town in Wayanad District. The Sultan Battery near Mangalore is a small watchtower. Both have connections to Tipu Sultan. Heeheee! Cool poem! I didn't understand all of it, but it was funny! So Bombay has lots of traffic jams, huh? Then what about my horse carriage ride? >:( I want to sing "Yeh Hai Bombay Meri Jaan"! Homeschooled? God help the poor soul who is going to homeschool you! And no, you cannot watch Kati Patang when you are being homeschooled, unless film appreciation is part of your curriculum. Which begs the question, have you moved to the US for good? I thought you were here for your summer hols. Oh, I am definitely an expert on the liquor shops in Kerala, considering the first word I learned to read in Malayalam was "saraayam" - since every little jhopdi on the side of the road seemed to have this sign, a bench and four or five inebriated guys lolling around! I am also an expert on the hartals of Kerala, since I spent a few years working for the premier banking institution there, the State Bank of Travancore! That was definitely an interesting stint! Kerala is not on the cards for this visit, so I have asked the uncle in Kerala to make a quick trip to Madras, instead! But Bangalore is definitely there, since I am attending a wedding there, and then we move on to Delhi, Agra, Jaipur and Ranthambhore, which is the part I am looking forward to, especially the last one! Awwww, they're not bad! THEY'RE AWESOME. :D Although today I was out on my bicycle (Which I finally learned how to ride! ), and I started pretending it was Rajesh's "Zindagi Ek Safar" motorcycle. So I swayed from side to side and then fell off. And got a long gash on my left leg. :P And did I tell you about the time I tried to break a stick like how Rajendra did in Jhuk Gaya Aasman and got cuts all over my hands because it was too prickly? And yeah, I like the book! The English is so different (although I can understand it), and today I saw a bit of the movie. New one. Mehh, the guy playing Darcy was NOT handsome. I keep picturizing Shammi as Darcy now. And somebody can be Bingley, he doesn't seem too bad! You wouldn't think so , but only yesterday I was telling my better three quarters about those poor photons being blocked by the traffic and all. They try to go forward and run up blind alleys and get trapped between all those vehicles and people and they look so tired and wan and woebegone that people pick them up and put them into little black plastic bags. Darkness is so comforting. Those bags they are called light bags, they are truly very light. The bags are opened in the morning which is why dawn is so bright in Kerala.' Tis a sorry tale Dustedoff, but as the good Q G Murugan said, "Ve are like that wonly." Mind it , I say. Do tell, was your SBT office a den of vice and sin and and days and afternoons spent in bawdy revelry? Lalitha, when and where did you work for SBT? My brother has been working there for ages; you may even have known him! I don't know; I wonder if your gran knows what she is taking on! If I was in her place, I would put you into the strictest convent I could find, one that would not allow a whiff of cinema to get inside, until you were 18. Sigh, You make me feel v.e.r.y old. Hmmm, I may have to add a disclaimer here: Anything done in my pre-married days will not be disclosed! I was in the Bank from '73 to '81, and I did stints in their Madras Main branch, Head Office in TVM, Ekm MG Rd Branch, Bangalore Main branch, and was known as Lalitha Krishnan in those glorious days. But I don't remember any Warriers, or was his name something else? I cannot answer this question on the grounds of self-incrimination! Seriously, though, our days and afternoons were spent looking at the books. What we did in the evenings is another matter altogether! By the way, the other word that I learned to read in those early days was "kaLLu" - so does it mean I was interested in words dealing with liquor, or were those the most frequently seen words in Kerala in those days? Good one, but who is Q G Murugan? I am lost here. Ahem... You have forgotten your roots that had yet to grow when you got transplanted. Aww come on! If I go to a convent, I can't pretend the coke in my glass is alcohol and go crashing around the house singing "Yeh Jo Mohabbat Hai", or annoy my music teacher by picking up an accoustic guitar and pretending to play it while singing "Baar Baar Dekho"! And I can't stay up alll night while watching movies on my iPod! No, too young. :) He joined SBT in '84 or '85. I'm back in India last week of October. It would have been nice to meet up! God! *I* need a drink now, and a stiff one! Will you be in Kerala for the duration of the visit? Or can you come to Delhi, so we can meet up with DO? Or how about coming to B'lore? Unfortunately, I have some major stuff to do in Madras in connection with registering my Dad's property in my name and my sister's, and knowing how the bureaucracy in India functions, I fear it will take up most of my time. How long do you plan to stay in India this time? Hubby and sis return to the US on the 22nd of Nov, after that, I am on my own, so I have some free time. Hmm, never heard or seen these before! I will have to do some digging through Youtube for more episodes. Were these commercials or a regular series? Definitely after my coming to this country, or as you have put it, after I got transplanted! You know, I wondered about that but couldn't remember if I had seen a cha or a sa! When you are off regular blogging, you are so good, when you come back you would be mind blowing! My compliments on an excellent write up and Sadu's fantastic poem! All those plans sound lovely! But, alas, I'm in India for exactly a week. It's my niece's wedding. I reach on 26/10 and leave on 3/11. Quick Gun Murugan was originally a character developed for V TV in India in '92 (I think). They were ads for the channel, and became a massive hit. A couple of years ago, the writer/director of the series, Shashank Ghosh, extended it to make it a full-length film. Hey! I can't drink alcohol! :( Except that whiskey I told you about, but I coughed and coughed so it was no good. So I can't sing "Din Dhal Jaye" or "Hai Duniya Usiki" or anything! I'm jealous! Hey Anu... Chembukkau, Patturaickal... Even I belong to Thrissur.. So glad to see these names in the poem of a fellow blogger! And yes... the pun is really enjoyable! Shouldn't that be more of a "poodul" rather than a "poodle"? Just wondering. Another Thrissurite? :) The world is truly a small place. Will pass on your message to my husband. Ha Ha :) this is an awesome post - especially like the poem - had me in splits throughout! This was really really amusing Anu. Do convey my appreciation to your dear husband. wife house, god of traffic jams - LOL! Thank you. Bollyviewer's blog was the inspiration for this.